Following a near full house launch event at the Barbican Cinema last week for the prestigious London Jazz Festival for a screening of the Italian rarely seen new wave classic L’assassino, Jazz on Film Records announces the new release of its specially annotated collector’s edition vinyl LP compilation ‘Jazz in Italian Cinema’. Released on Friday 25th and distributed by Proper, the LP is now available to purchase on this website. Digital format with special inserts/notes pdfs coming very soon! 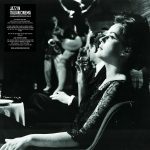 As well as high quality specialist jazz remastering and expert curation, the extensive, in-depth sleeve notes to Jazz in Italian Cinema traces the emergence of the jazz soundtrack in Italy through the late 1950s-60s and the crucial role it played in bringing jazz to the attention of a wider Italian public. The collection features some of the earliest jazz soundtracks in European cinema written by the ‘Big 3’ Italian film composers Piero Umiliani, Piero Piccioni and Armando Trovajoli as well as pioneering musicians such as Giorgio Gaslini, the MJQ’s John Lewis and Sandro Brugnolini. Brought together here for the first time are jazz soundtrack rarities that emerged out of the late 1950’s Golden Age of ‘Commedia All’Italiana’ through to the experimental early 1960’s arthouse cinema of film directors ranging from Elio Petri to the great Michelangelo Antonioni. It’s an area of Italian jazz that’s had far less in the way of in-depth coverage than another ‘golden era’ in Italian ‘jazz on film’ covering a later period of the 1960-70s. Ranging from swing to the cool/hard bop of the late 1950s (Piero Umiliani’s pioneering comedy scores for I soliti ignoti and its sequel featuring Chet Baker’s exquisite trumpet solos) through to the expanded possibilities for jazz in the early 1960s in both modal and ‘third stream’ settings (including pianist Giorgio Gaslini’s Blues L’allalba from Antonioni’s La Notte and a piece from MJQ pianist John Lewis’ rarely heard chamber jazz score for A Milanese Story). But Jazz in Italian Cinema is much more than a collection of rarely heard soundtracks. Pressed on heavyweight 180gm vinyl with an elegant post-retro design, it also comes with an old school attitude to enlighten as well as entertain demonstrated by the extensive, in-depth back sleeve and insert notes written by Jazzwise film expert Selwyn Harris and Siena based jazz archivist/author Francesco Martinelli.